TROMS COUNTY, NORWAYA lone reindeer emerges from the forest, prompting the Sami herders to bring their snowmobiles to a stop in the middle of a clearing. All three are bundled in sheepskin hats and wool capes, called luhka, against the chill wind of a late-January morning in the Norwegian Arctic. Johann Anders Oskal scans the snowy hills with binoculars, on the lookout for stragglers from the herd, while his younger brother Danel shovels food pellets from a sled. Their cousin, Aslak Tore Eira, hops back on his snowmobile to round up animals as they trot into the clearing. Within moments, dozens of reindeer gather for a mid-winter snack, their antlers silhouetted against white mountain slopes and a twilight-blue sky. After an unusually warm autumn brought forth clouds of biting insects that relentlessly pursued their reindeer, the early weeks of 2016 have been a herder’s dream. Light, powdery snow blanketed the undulating hills and mountains that make up the Oskal family’s winter grazing grounds in central Troms County, a few hours’ inland drive from the Norwegian Sea coast. The dry snow makes it easy for the family’s 2,000 reindeer to reach nutritious grasses and lichens buried beneath the surface. The daily feeding runs into the backcountry serve not only to bolster the animals’ winter diet. They also discourage the semi-domesticated reindeer from straying too far into the woods, where bobcats, lynx and wolverines lurk. “One lynx can kill up to 100 reindeer in a year,” says Johann, who then describes a particularly violent lynx attack on a doe as she was giving birth. Troms County is a sprawling region of broken coastline, labyrinthine fiords, and rugged alpine forests, situated some 700 miles (1,150 km) north of Oslo. This is the heart of Sami country, where Lapp nomads once moved their herds across vast distances to the rhythm of the seasons, oblivious to national borders. Those days are long gone. Of the estimated 100,000 Sami spread out across northern Norway, Sweden, Finland, and Russia’s Kola Peninsula, only about 10,000 still herd reindeer for a living. Reindeer meat is an important part of a herder’s diet, as well as the sole source of income for some families. For part-time herders, the animals’ meat and hides augment their earnings from other sources. Today, reindeer herders find themselves increasingly boxed in by powerful interests competing for their traditional grazing lands. Dams, roads, live-fire military drills, high-voltage power lines, even green energy projects such as wind farms all have nibbled away at grazing territory. Of particular concern to the Sami leadership are a proposed copper mine in Finnmark County to the north and a windmill park just to the south. So far, no single project has posed an existential threat to the herding culture of the Sami, Western Europe’s only indigenous people who inhabit the Arctic. But the cumulative impacts–a road here, a pipeline there–have reduced Norway’s undisturbed reindeer habitat by 70 percent in the past century and reshaped the way reindeer herding is done. Technology is a double-edged sword for the Sami. On the one hand, it provides herders with the comforts of modern life–warm houses, GPS collars and smartphone apps to track their animals, snowmobiles and ATVs to round them up. On the other, the steady encroachment of industrial infrastructure has reduced their range and freedom of movement, requiring them to move herds by truck and boat between summer and winter pastures. It’s an expensive undertaking, and herders receive just a one-time payout to compensate losses when courts override their objections and approve large-scale projects. As Norway, one of the world’s wealthiest countries per capita, pushes forward with plans to extract more resources and build more industry in the Arctic, Sami leaders fear their languages and culture, largely sustained by herding families, will be sacrificed to produce wealth for the larger society. Keskitalo said the proposed Kalvvatnan wind farm and associated power lines in Nordland County will severely impact the summer grazing lands of a core group of reindeer herders who still speak South Sami, one of five Uralic languages traditionally spoken by the Sami that are listed by UNESCO as endangered. The wind farm is still under judicial review. A final decision is expected later this year. The Norwegian government says it’s sensitive to Sami concerns, but warns that to meet its ambitious targets for renewable energy, more hydroelectric and wind power projects will be built. Such projects often have an impact on reindeer herding, as well as on biological diversity and wilderness landscapes, Minister of Petroleum and Energy Tord Lien acknowledged. In a statement provided by the ministry, Lien said that “thorough discussions with all affected parties are of great importance in the licensing process for applications” of renewable energy projects. Finnmark County’s proposed Nussir mine holds a potential of 66 million tons of copper ore and lesser amounts of silver and gold. The government green-lighted the project after the company agreed to dump waste tailings into a nearby fjord, rather than into open pits on land. That was meant to minimize the loss of reindeer habitat, but dumping the waste at sea could affect small-scale fishermen, who are also Sami. The Oskal brothers and their cousin Aslak have been locked in a long-running battle over land and grazing rights with the Norwegian Armed Forces. Since the Cold War, soldiers have been training here for a possible Russian thrust across the top of Scandinavia. The crackle of gunfire echoes across the hills on a daily basis as troops in white winter camouflage stage exercises in Arctic warfare within earshot of the reindeer. The drills often force the three herders to take circuitous routes through the forests to stay safe while tending to their animals. “These are the guys who are going to protect us from the Russians,” Johann Oskal darkly jokes as a caravan of snowmobiles bearing soldiers in helmets and winter jumpsuits zooms past. For the Oskal family, the presence of Norwegian troops represents a more immediate challenge to their livelihoods than a Russian invasion that may never come. 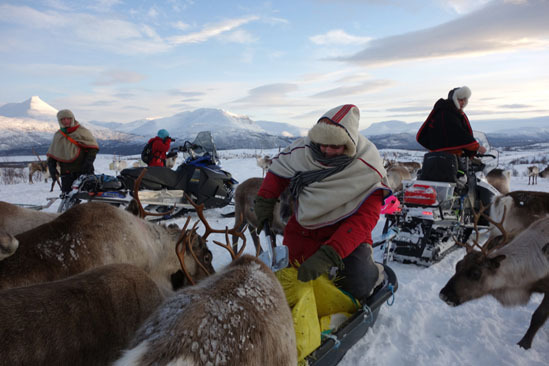 Like other indigenous reindeer herders in Norway, the Oskals enjoy the right to use their traditional lands for grazing animals but the land belongs to the government. The case dragged on for 20 years before the court ruled that military expansion could proceed with the Oskal’s receiving a cash payment. Danel Oskal stirs the ashes of the fire, his face aglow in its flickering light. He pulls a Bowie knife from a sheath and carves pieces of dried reindeer meat off a bone. More and more, he says, he finds himself thinking about his infant daughter and what life will be like when she is grown.